We report a glomus jugulare tumor in a 60 yrs old female; non diabetic, non hypertensive who presented with continuous pulsatile hissing tinnitus in right ear with progressive hearing impairment and fullness in the ear. Detailed history and examination with aid of investigations it turned out to be glomus jugulare, treated by surgical excision by post auricular hypotympanotomy approach. A 60 year old lady, reported with chief complaints of continuous pulsatile hissing tinnitus in right ear and progressively increasing impairment of hearing from last two years, with heaviness in right mastoid region. There was no history of ear discharge, giddiness/vertigo or facial weakness. There was no history of difficulty in swallowing and hoarseness of voice, palpitation or inability to lift shoulder. 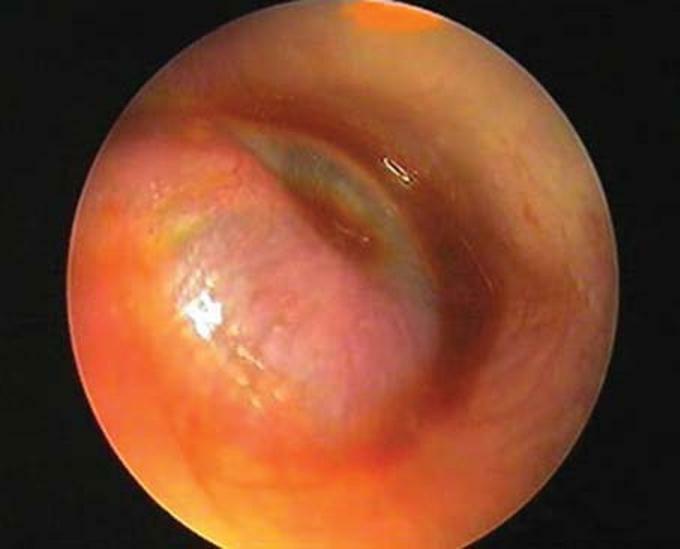 On Otoscopy pulsations were seen in the posterior half of tympanic membrane with bulging and congestion. 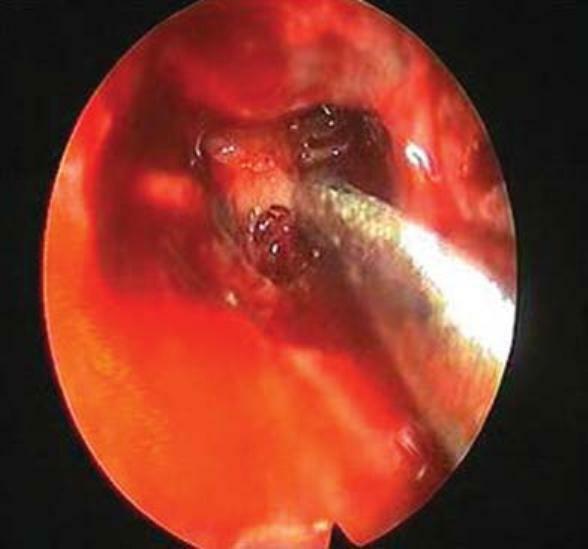 Handle of malleus was ill defined because of bulging and congested tympanic membrane [Figure 1]. Tuning fork tests showed Rinne's negative on right side and Weber's lateralized to right ear. On pure tone audiometry, there was right moderate conductive hearing loss. HRCT temporal bone showed dehiscent jugular bulb in right middle ear with soft tissue mass in middle ear without intracranial extension [Figure 2]. All routine hematological investigations were normal. 24 hr urine VMA level was in normal range (3-4 mg/day). On this basis non-secretory glomus jugulare was diagnosed. As per the classification devised by Oldring and Fish, the tumor was type A (tumor limited to middle ear cleft). Patient was treated successfully by surgical excision of tumor. Postaural Wilde's incision for better exposure was taken. The skin and periosteum of the anteroinferior and posterior osseous meatal wall elevated and pushed upward for exposing the tympanic bone from the tympanomastoid suture behind to the tympanosquamous suture in front. Bony meatus enlarged by thinning down the anteroinferior to posterior meatal wall with cutting burr and curette. The annulus was elevated from its sulcus posteriorly and anteroinferiorly confined to the lower half of tympanic cavity. Tympanic membrane folded upward upon itself and the tumor came into view. Resection of the bony sulcus inferiorly and posteriorly was done to expose the hypotympanum and tumor in it. The extent of the tumor in all directions delineated by curetting the bone. The tumor was rapidly dissected away from the promontory and floor of hypotympanum with side knife and cotton balls. Base of the tumor was cauterized and tumor was excised with crocodile forcep. Bleeding was controlled with gelfoam pack. Dehiscent jugular bulb was sealed with bone wax [Figure 3]. Tympanic membrane and tympanomeatal flap reposited back and postaural wound was sutured. Tumor size was 1 cm. The Postoperative histopathology report was an encapsulated mass consisting of convolutes of capillary sized vessels; surrounded by zallballen of glomus cells, diagnosed to be glomus tumor. The most common symptoms are pulsatile hissing tinnitus, conductive hearing loss. Other aural signs and symptoms are ear fullness, otorrhea, hemorrhage, bruit and the presence of middle ear mass. Significant ear pain is uncommon. Involvement of inner ear produces vertigo and sensorineural hearing loss. Cranial nerve involvement produces hoarseness and dysphagia. The presence of jugular foramen syndrome (paresis of cranial nerves ix to xi) is pathognomic for this tumor, but it usually follows 1 yr after the initial symptoms of hearing loss and pulsatile tinnitus. Less commonly glomus tumor produces facial nerve palsy, hypoglossal nerve palsy or Horner's syndrome. Headache, hydrocephalus and elevated intra cranial pressure may be produced by intra cranial extension of tumor. Alpha-blockers and beta-blockers are useful for tumors secreting catecholamines. They are usually administered for 2-3 weeks before embolization and/or surgery to avoid potentially lethal blood pressure lability and arrhythmias. Successful treatment of pulmonary metastases with etoposide (VP-16) and cisplatin has been described. Preoperative superselected embolisation done to reduce bleeding and complete resection with ease. Surgical therapy is definitive treatment for glomus tumors. For smaller tumors i.e. fish type a, post auricular hypotympanotomy or transcanal tympanotomy done for complete resection. The mass is avulsed from the promontory and the bleeding is controlled by microbipolar cautery or light packing. Bone wax sealing is done for the bone defect in promontory. The tumor involving mastoid air cells system transmastoid resection is performed, which comprises of complete mastoidectomy with extended facial recess exposure. Larger glomus jugular tumors removed by means of lateral skull base surgery and represent a multi disciplinary team effort. A major advancement in the surgical treatment of glomus jugulare tumors occurred with the development of preoperative superselective embolization. High index of suspicion, with early diagnosis and appropriate treatment i.e. complete excision of glomus jugulare, can reduce the morbidity and mortality as has been seen in our case. 1. Oldring D, Fish U. Glomus tumors of temporal bone: Surgical therapy. Am J Otol 1979;1:7-18. 2. Jackson CG, Glasscock ME, Harris PF. Glomus tumors. Diagnosis, classification, and management of large lesions. Arch Otolaryngol 1982;108:401-10. 3. Brewis C, Bottrill ID, Wharton SB, Moffat DA. Metastases from glomus jugulare tumours. J Laryngol Otol 2000;114:17-23. 4. Manolidis S, Shohet JA, Jackson CG, Glasscock ME 3 rd . Malignant glomus tumors. Laryngoscope 1999;109:30-4. 5. Jansen JC, van den Berg R, Kuiper A, van der Mey AG, Zwinderman AH, Cornelisse CJ. 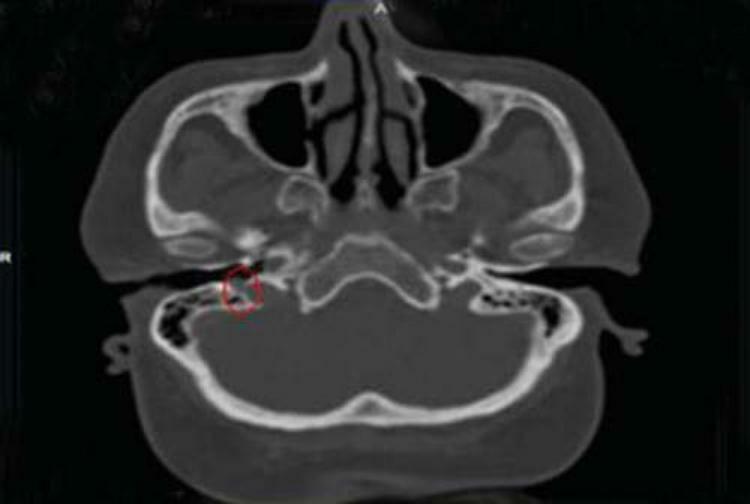 Estimatiion of growth rate in patients with head and neck paragangliomas influences the treatment proposal. Cancer 2000;88:2811-6. 6. Netterville JL, Jackson CG, Miller FR, Wanamaker JR, Glasscock ME. Vagal paraganglioma: A review of 46 patients treated during a 20-year period. Arch Otolaryngol Head Neck Surg 1998;124:1133-40. 7. Cheesman AD. Glomus and other tumors of the ear. In: Booth JB, editor. Scott-Brown's Otolaryngology: Otology. 6 th ed. Oxford: Butterworth-Heinemann; 1997. p. 323-7. 8. Guild SR. The glomus jugulare, a nonchromaffin paraganglion, in man. Ann Otol Rhinol Laryngol 1953;62:1045-71. 9. Braun S, Riemann K, Kupka S, Leistenschneider P, Sotlar K, Schmid H, Blin N. Active succinate dehyrdogenase (SDH) and lack of SDHD mutation in sporadic paragangliomas. Anticancer Res 2005;25:2809-14. 10. Gulya AJ, Minor LB, Poe DS. Glasscock-Shambaugh Surgery of the ear. 6 th ed. People's USA: Medical Publishing House; 2010. p. 730-46. 11. Spector GJ, Maisel RH, Ogura JH. Glomus tumors in the middle ear. I. An analysis of 46 patients. Laryngoscope 1973;83:1652-72. 12. Glasscock ME III, Harris PF, Newsome G. Glomus tumors: Diagnosis and treatment. Laryngoscope 1974;84:2006-32. 13. Hawthorne MR, Makek MS, Harris JP, Fisch U. The histopathological and clinical features of irradiated and nonirradiated temporal paragangliomas. Laryngoscope 1988;98:325-31. 14. Glasscock ME, Gulya AJ. Glasscock-Shambaugh Surgery of the ear. 5 th ed. USA: People's Medical Publishing House; 2003.